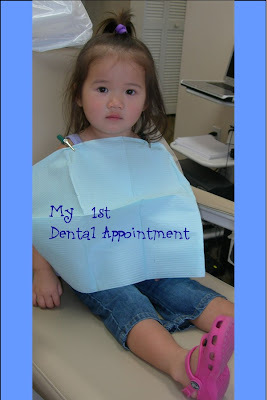 Mia had her first visit to the dentist today! As you can see, she had her concerned, I am thinking about it look. She was a very brave girl and sat in the dental chair all by herself, holding my hand while I sat next to her. Daddy was sitting on the stool and the end of the room very proud of his BIG girl. She got all her teeth polished front and back using the handpiece and she let Maria apply fluoride varnish to all her teeth. She liked when I took the suction to get out the water and she wanted to try "Mr. Thirsty" herself. When her visit was complete, she raided the toy chest and got lots of TLC and attention from everyone in my office. Dr. Huot said everything looked great and he was very impressed on how well she did, considering some adults do not cooperate that well! What a big girl Mia has become. What a great patient. She looks so adorable too.